The Lucerne Festival Strings have received on loan the c.1680 ‘Sellière’ Stradivarius, played by the Austrian virtuosos Wolfgang Schneiderhan from about 1934 until 1979. The instrument has not been heard in public for 40 years. 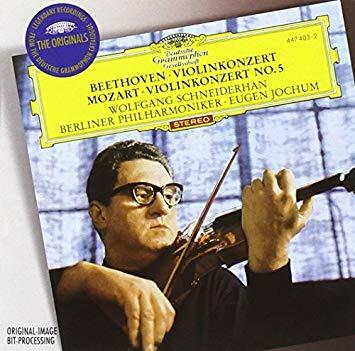 Schneiderhan, concertmaster of the Vienna Philharmonic from 1937 to 1951, was a prolific soloist on Deutsche Grammophon, recording the 10 Beethoven sonatas with his friend Wilhelm Kempff. He was also a founder of Lucerne Festival Strings. Was this the violin that was badly smashed and then restored? There was certainly a Strad that belonged to Schneiderhan that later proved difficult to sell because of the accident. I do believe that most of Schneiderhan’s recordings — and there are some splendid ones, including a memorable Mendelssohn Concerto –were on a different Strad, the one now known by his name. I believe the “Sellière” Stradivarius (said to be c.1672, not 1680) was loaned to the Wiener Philharmoniker for some time and, during that time, was also played by Schneiderhan. While it wasn’t his primary instrument, he was the last person to play it in public performance (the violin has been laying in a safe since the early 1980s). The Stradivaris that Schneiderhan is most know for having owned/played are the 1704 “Liebig” (now “Liebig, Schneiderhan” I believe) and the 1715 “Schneiderhan”. In 1902, the violin makers Caressa & Francais attributed this instrument to Stradivari’s late production phase and dated the instrument to 1727 (the last two digits on the label are illegible). Over the years however, other experts began reassessing much of the old valuations and it is now generally considered that this particular instrument violin was fabricated circa 1715. 1715 or 1727,so be it. It is one helluva fiddle! IMO,Wolfgang Schneiderhan is a very underrated violinist.